Warm yellow gold combines with the soft, melted butterscotch color of a genuine citrine gemstone in this plain citrine cross pendant in 14K yellow gold from Apples of Gold Jewelry. The highly polished cross pendant, which measures approx. 1 inch tall and 1/2 inch wide, has a prong setting, which contains a beautiful, AA rated citrine gemstone. The citrine stone measures 1.75mm in size, and pairs nicely with the warm yellow gold of the pendant, creating a look that you are sure to love! "But seek ye first the kingdom of God, and his righteousness; and all these things shall be added unto you. "(Matthew 6:33). 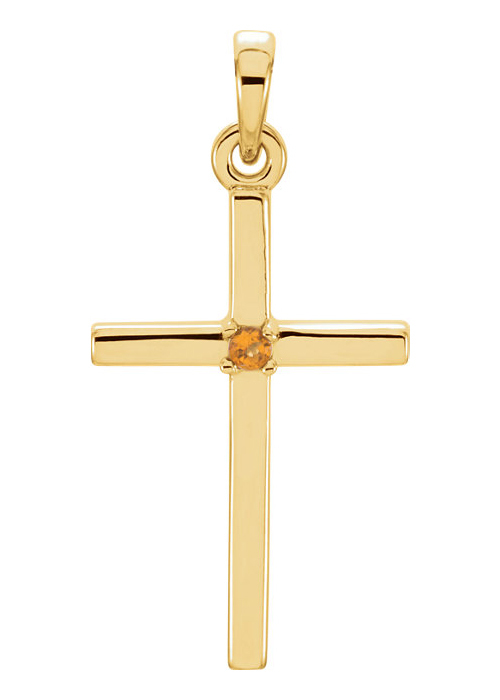 We guarantee our Plain Citrine Cross Pendant, 14K Yellow Gold to be high quality, authentic jewelry, as described above.